The Peace Studies discipline seeks to provide the intellectual structure for nonviolent approaches to personal, national, and global conflicts. Direct violence emerges from structural, cultural, and personal patterns that support it. Thus, sustainable peace requires more than the ending of direct violence, but also the building of cooperative structures, creative cultures, and conflict resolution capacities in human relationships. In the twenty-first century, the problem of violence exists on multiple levels, from domestic abuse and entrenched poverty to international armed conflict, terrorism and counter-terrorism. We face the prospect of a nuclear conflagration on one side, with the daily reality of low-technology conflicts in dozens of countries on another. In the organized violence of warfare, far more civilians die than soldiers; small arms destroy more than sophisticated weaponry, and war-related poverty, displacement, and disease are the biggest killers of all. Moreover, in refugee camps and urban communities alike, the pervasive incidence of violence within families and communities feeds and is fed by violence in its other forms. 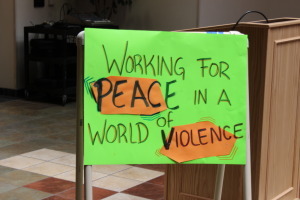 Peace Studies students analyze historical, philosophical, socio-cultural, political-economic and psychological influences that often lead to violent conflict, and the nonviolent alternative pathways toward sustainable peace. In both classroom and experiential learning, students are invited to think critically about our world, to act creatively, and to fashion their own and our collective future in a holistic and supportive educational environment.